A modern, comfortable apartment situated in beautiful countryside and with full use of the owner's lovely garden. The area is a walker's paradise with footpaths leading from the property to the mountains and around the delightful town of Hay-on-Wye.Near to Offa's Dyke long distance path.The property has one bedroom but is fully equipped for four people. There is a sofa bed in the sitting room. Off road parking available together with secure cycle storage. We have lived at Lansdowne ever since moving to the area from Nottingham in 2001 and can't imagine living anywhere else. The scenery is amazing, the walks are incredible and the nearness of the lovely little town of Hay-on-Wye is an added bonus. After many years of visiting the area we decided to move here and fell in love with our house Lansdowne, which was being run as a bed and breakfast.The house is in a perfect position with stunning views and a beautiful garden. In 2008 we built the self-contained annexe with the purpose of using it for holiday lets as we were aware that more and more people preferred to have self-catering holidays. Fully equipped kitchen with fridge, microwave, cooker, hob and ample kitchen units.Use of washing machine and drying facilities if required. Selection of books and maps of the local area provided. Guests are welcome to use the owners' delightful garden. The apartment has a large, airy open plan sitting/dining/kitchen with wooden flooring and benefits from underfloor central heating. The sitting area has a flat screen TV with freeview and DVD player. Guests will find a good selection of books, maps and information about the local area. 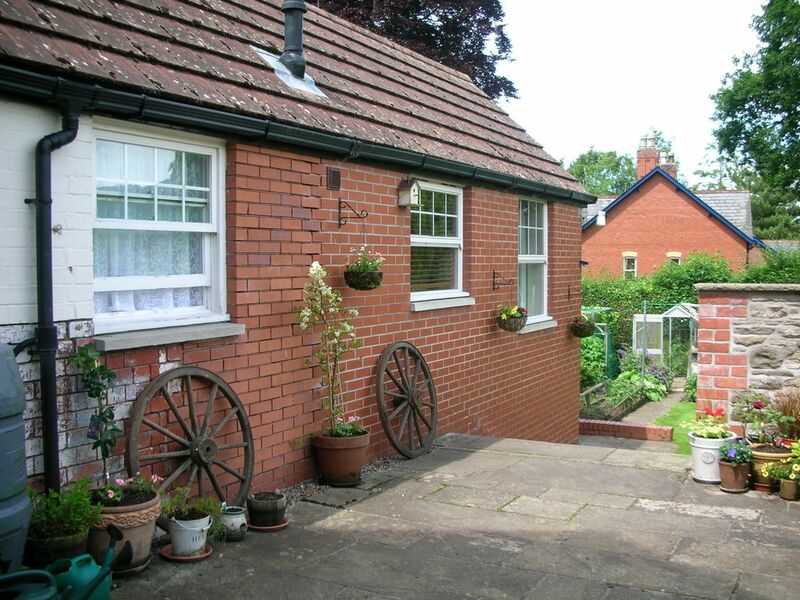 Outside: There is a lovely, large garden to the rear of the property which is part of the owners adjoining guest house. Guests are very welcome to use it and will find several seating areas complete with tables and chairs. A BBQ is available on request. The garden looks out over open countryside and is a peaceful haven to have breakfast or to enjoy a glass of wine after a good day exploring the area or walking in the Black Mountains. Off road car parking adjoining the property. Cleaning / Towels / Linen / Maid service: Towels and bed linen provided. We stayed at Lansdowne from the 10th March for a few days. Everything you need all under one roof. Couldn’t fault it at all. Would definitely go again. Perfectly situated with walking distance into Hay on Wye. Comfortable and clean with amazing views. Stuart and Sandra were so welcoming and Buddy our dog was made very welcome too with a bowl of dog biscuits greeting him on our arrival. Loved every moment of our stay in Cusop. Holiday apartment was spacious, comfortable and pleasant with a well equipped kitchen area and a luxurious bathroom. It is just a 15 minute walk (across the fields) from Hay-on-Wye - or a couple of minutes by car. There are lovely views from all windows and peaceful and quiet environment. Apartment was spacious for 2 and well equipped. There are steps up to the apartment. Easy access into Hay on Wye with a well used footpath over the fields. Hay is a nice town to walk around. Used as a base for walking and book shopping. We had a comfortable relaxed stay. There were several walks that we were able to take. Very enjoyable. In walking distance to restauran A and shipping in Hay-on-Wye. Lots of space, very clean. The nearest train station is Hereford (20 miles) Public transport is infrequent and use of a car is therefore recommended. The local area has a wealth of outdoor pursuits including riding and trekking/ mountain bike hire/canoe hire/outdoor activity centres/walking. Hay-on-Wye with it's many second hand bookshops, pubs ,restaurants and cinema is only a 10-15 minute walk or a couple of minutes in the car. Changeover Day: Changeover day is normally Saturday but can sometimes be altered. Short breaks available (minimum 3 days) except in July/August The property is available after 3.00pm on the day of arrival. To be vacated by 10.30am on the day of departure. Notes on prices: Prices include gas/electricity. Prices for short breaks available on request.